We are happy to present the excellent Tanita BC533 Glass Innerscan Body Composition Monitor. 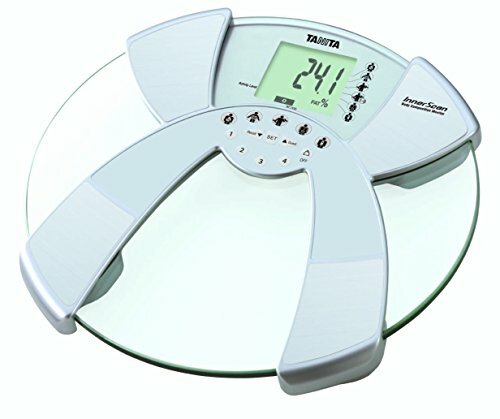 The Tanita Glass Innerscan Body Consumption Monitor Scale provides the following functions - body water percentage, muscle mass, bone mass, daily caloric intake, metabolic age, visceral fat, rates your physique, and a four person recall. Because of the four person recall feature, every member in the household can now monitor their daily health, without having to leave the house. The weight capacity is 330 pounds and measures in increments of 0.2 pounds. The 2.25 inch LCD screen is very easy to read. The contemporary circular, thin, glass design with silver accents is certain to fit in with any decor. From Tanita, The Body Fat Experts, comes the BC 533 Innerscan Body Composition Monitor. Using BIA technology which is widely used in the medical field, the scale is a unique and highly accurate body composition monitor. This product not only measures weight and body fat, it also tells you your body water %, muscle mass, bone mass, daily caloric intake, metabolic age, visceral fat and rates your physique! The Body Water % is the total amount of fluid in the body expressed as a percentage of total weight. The muscle mass is the amount of muscle in your body. The Bone Mass is the weight of your bone in your body. The Metabolic Age compares your Basal Metabolic Rate to the average age associated with that level of metabolism. The Visceral Fat is the fat in the abdominal cavity (stomach), surrounding the vital organs. The Physique Rating is a rating of your body type; 1-9. Its sleek, modern design of glass and silver accents is a complement to any bathroom. 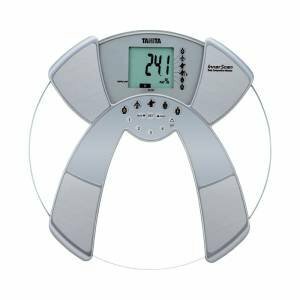 Monitor your health and fitness with a Tanita Innerscan Body Composition Monitor. The scale has an Easy to read 2.25 LCD Display with the 4 person memory. The Weight, Body Fat and Body Water Recall function allows users to see the previous result. The scale has the Weight Capacity of 330 lb with the increments of 0.2 lb. The Body Fat and Body Water readings are in increments of 0.1%. 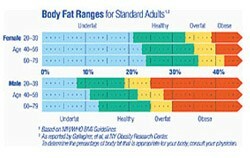 The Healthy Range Indicator bar shows where the body fat % fits into the healthy body fat range. The scale has a Guest Mode as well as Child and Adult mode. The Weight Only Mode allows you to use the scale a regular bath scale. The scale includes 4 AA batteries. Monitoring features help you keep tabs on your body composition and health. View larger. There is more to healthy dieting than weight loss alone. Body fat percentage measurements are also important indicators of good health. View larger. this monitor analyzes a full range of body measurements, including weight, body fat percentage, body water percentage, metabolic age, physique rating, visceral fat, muscle mass, and bone mass. It's a mouthful of measurements, but what it means is that with the Tanita BC533, you now have the unprecedented ability to monitor your body and the effects of your diet and fitness routines, comfortably and affordably in the convenience of your own home. With the Tanita BC533 up to four unique users can benefit. Simply supply your gender, age, height and weight into the memory, step on the scale, and the monitor does the rest. The results are analyzed according to each user's information, and the result -- displayed in the monitor's 2.25-inch LCD screen -- is the one of the most comprehensive at-home readings you can get. 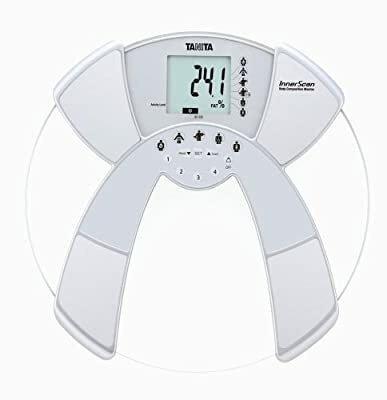 This monitor, which is about the same size as a typical bathroom scale, is ideal for anyone who is serious about monitoring their health and fitness. Knowing your body fat percentage -- the amount of body fat as a proportion of your body weight -- is essential if you want to create a diet and exercise plan that helps reduce the risk of certain conditions such as high blood pressure, heart disease, diabetes and cancer. Body water percentage is the total amount of fluid in your body expressed as a percentage of your total weight. Maintaining a healthy body water percentage ensures that your body functions efficiently. The metabolic age level is related to your body's metabolic rate and helps you maintain the daily minimum level of energy or calories your body requires when resting or sleeping to function effectively. Even though your total body weight might not change drastically over time, your muscle mass and body fat levels may be changing. Keeping tabs on them can help you stay at a lower risk of certain diseases. And knowing your levels of visceral fat -- the fat in the abdominal cavity and surrounding the vital organs -- can help you keep heart disease and high blood pressure at bay, and may delay the onset of type two diabetes. In short, this monitor gives you essential information and greater control as you work to stay healthy and live a more active, vital life. Operating on four AA batteries (included), the Tanita BC533 is intended for use by persons up to 330 pounds and is backed by Tanita's 3-year warranty. Note: Pregnant women should not use this monitor, and if you have a pacemaker or other internal electronic medical device, you should not use the body fat reading feature.